One of the ways I have "monetized" this blog and other efforts in the social space has been the privilege of getting out and speaking to folks in the marketing field from a variety of perspectives. The refreshing part for me is that many marketers who I talk to are expressing the desire to move away from gimmicks, and traditional campaign thinking to solutions that offer more long term value and builds relationships. The Microsite is actually a great thing. It allows us to quickly launch an initiative that can link out to and be linked to from other sources and allows marketers to bypass slower moving large scale site efforts. But increasingly, microsites are being cranked out by the thousands. Many of them are sold as "high-engagement" vehicles when in reality they become souless, glossy artifacts that come off as traditional promotions in a digital shell. Microsites as a format are not inherently bad, but we really need to think about why users will want to spend some time there, and even more importantly, why they would come back. We need to think of Flash the same we think about incredibly powerful mediums such as television and radio. When done well, television can inspire and motivate us—when done awfully it comes off as annoying and makes us want to flip channels. I think Flash is a wonderful technology and tool, but like any powerful tool it gets abused way too much, often times at the expense of the end user. I've written about Flashturbation before and urge designers and marketers to use the technology responsibly. Think about what happened to airbrush artists who spent all of their time pushing that technology to it's limit. Where are they now? "The Big Idea" is still very much alive and well—but it's less relevant than it's ever been. Especially big ideas that start with a top down broadcast messages first. This is campaign thinking in it's finest and does not translate directly in a fragmented 2.0 world. Bud.TV for example was a "big idea" fueled by traditional thinking—what followed was a "big bang" launch, but not the engagement. Marketers are going to need to diversify how we think, which means supporting both big ideas and lots of "big-little ideas" that can thrive in the niches. That's one of the biggest challenges marketers now face. Thinking in niche—the internet thrives on it. Let's get this straight. Peer recognition is important and we should celebrate when one of our own does something remarkable. But the awards industry is here to make money too—and many of us are all too happy to forget about putting customers first in the pursuit of praise. Agencies especially have to come to terms with this and should all talke a cue from what's arguably the #1 brand in existence right now. Google. We really need to think hard about how compatible awards are with being "Googly". Actually, they are—but one needs to come before the other. The "social revolution" is real, transformational and not going away. However, we need to proceed with a little caution. Not every tactic requires "conversation". Marketers need an intimate understanding of how social networks actually function and what is has to do with their business and brands. Then, we need to try a few things and learn by doing. But there's gold in them thar hills—which means that everyone right now who is claiming to be an expert in this area could potentially steer you wrong. I am way more active than most when it comes to the social space and I would NOT consider myself an expert. Let's be smart about how we can take advantage of the behavioral shift in this area. We'll need to be better at establishing credibility before we can guide, and the last thing we need is snake oil salesman. Because much of marketing is deeply rooted in quick hits that demonstrate short term spikes, we've gotten used to an intense industry to work in that risks burning many of us out. The industry is fast paced and more than happy to put fresh meat to work. This is something that is not sustainable, especially in the digital space where there is a shortage of talent who truly knows what they are doing. We'll need to overcome this somehow and it will take some time. I've talked about BSOS (Bright and Shiney Object Syndrome), and most marketers are guilty of it. It stems from the addiction to always looking for the "next big thing" without gaining a deep understanding of what's on our plate at the moment. The result is a loss of credibility both in and outside of the industry. We'll need to do a better job balancing what's next with what's already here. The real risk here is creating initiatives that bomb because we missed the mark on where the customer's head was actually at in order to satisfy where our heads may be at. We're turning the internet into Times Square. While we digital marketers claim to be cutting edge, we're not willing to turn down the lucrative ad banner business. Again, there's nothing wrong with it—but for aspiring designers who work in marketing and someday want to design the next You Tube, banner ads will most likely not help you get there. If we're truly living in an "application economy", then marketing/ad campaigns are not the end all be all though they are still important. But the biggest shift powered by digital is that the average Joe/Jane has become the new storyteller and digital experiences are becoming more important to an empowered consumer who frankly has more options than ever before. Point in case, I recently ordered a replacement keyboard for my family's HP computer and was severely disappointed to see that HP had downgraded their industrial design. The original keyboard was stylish, finished with metalic silver and felt right to the touch. The new keyboard only comes in back and feels like plastic. HP's campaign "The Computer is personal again" now feels like a lie to me. If we get another PC, it will probably not be an HP—and no campaign can influence that. It's time for marketers to bring the product, the experience and the marketing together because the average consumer is no longer making distinctions between them. The future of marketing will take both storytellers + experience people to pull it off. 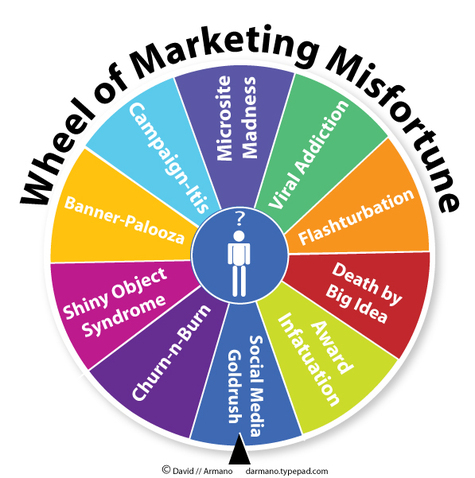 So that's the "Wheel of Marketing Misfortune" in a nutshell. There's no reason to sugercoat it. We're all smart people who want to make what we do better. Whether you're on the client or agency side—it's time to get to work. "None of this is inherently bad -- this isn't a gripe or a cry for help. It's simply an observation that not unlike e-mail, many of the social applications we use are becoming so convenient, so utilitarian that they begin to attract activity that we need to learn to filter out. Just ask any metrics analyst, they'll show you the stats of how effective well-designed e-mail initiatives can be. But there's a catch. Most effective e-mails are opted into by users who have decided to hear more from brands (or individuals) they trust. Violate that trust, and you are in the spam business. As social networks become mainstream, it will be business as usual. We'll log onto our network of choice, just as we log onto e-mail and sift through the spam. And we'll be making up our minds about brands and people along the way. Those who spam us will become a nuisance, something to tolerate. And those who make it worth our time will be rewarded with our trust and maybe even loyalty. As marketers and individuals, the choice to add value or generate more noise is ours to make." Last week I went to a local gathering in Chicago where people in the industry were meeting informally over a few drinks. It's the typical scenerio that we keep seeing more of—most people had been meeting for the first time even though they had heard of each other from some type of social network or another such as Twitter. Mike, an Apple employee was one of the first to greet me—and he extended a simple gesture. As he introduced himself he held up his iPhone which was displaying a digital name tag generated on the Web that he had just personalized moments ago. Within minutes, nearly half of the attendees of this small gathering were doing the same. it had gone "viral" so to speak—each person found our where they could customize their own "badge" and some were even adding "@" symbols so that their "Twitter friends" could recognize who they were. And this I thought was a simple but relevant example of how we are having "micro-interactions" in ways that we we can take with us. Today I'm moderating a panel on this very topic with Steve Rubel, Ian Shafer, Matt Dickman, Stephanie Agresta, And David Malouf. It should be a lot of fun as we'll be discussing how indivisuals and brands are making content and functionality "micro" and designing it "to-go". 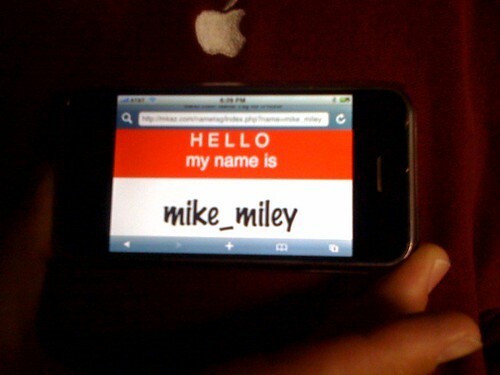 And of course a conference like this had to have both an iPhone and a Widget version (below). If you are going to the event, hope to see you there. "1. Blogs are only effective if you already have a brand. People come here, or go read Seth Godin, or Marshall Goldsmith, or Jeffrey Gitomer, or David Meister, because we’re all well known in our areas of expertise. That is, a blog follows a brand, not the other way around. You can’t create a brand just with a blog, unless you’re ridiculously lucky, and business can’t be based on luck." You are both right and wrong (aren't we all?). You've never heard of Robert Scoble etc. and until today, I've never heard of you. That is until this thing called the "network effect" amplified the things you had to say on your blog . You are right to point out that a brand comes before the technology which can either help that brand gain traction or lose credibility in the marketplace. But, digital media as opposed to traditional is all about amplifying a brand, product, service, or message to niche audiences and so the focus on that amplification is just as important as the brand itself. Millions of us are using various forms of social networks to connect with, mobilize and even influence very specific groups of people who fall within our specialized niche whatever that is. Unlike mass marketing which uses focus groups to appeal to middle America or (insert demographic here) the internet thrives on fragmentation, algorithms and networks made of people to spread ideas, product recommendations, information etc. Thanks to Google and various other search engines, digital touch points such a blogs, sites or other various incarnations of ourselves may be the first encounter someone has with our "brand"—be it company or personal. If in the words of Seth Godin, you offer up a "Purple Cow"—do something remarkable, then it's likely that the value you offer may get noticed and incorporated into some kind of sem-reoccurring interaction with individuals. As you point out, this isn't luck but in some cases it actually is. Value is subjective. All this may lead to influencing their behavior whether it be using your services, buying your product or just subscribing to the content you produce. But what may be the most critical piece for us to understand and harness is how amplification actually works. The mechanics of it are intricate to say the least. If you have nothing remarkable to offer, there tends to be no amplification. If what you have to offer is remarkably good—the network kicks into overdrive resulting in the influence of behavior and ultimately some type of relationship. If what you have to offer is remarkably bad—the network also kicks into high gear and amplifies the negativity—influencing behavior and often times causing perception and possibly relationships to go south. Michael Dell understood this when he prioritized the effort for his company to participate in the positive amplification of his own brand via the internet including multiple social networks. This ultimately lead to more than a 20% improvement of opinions found on the Web accessible through Google etc. Other major companies have watched closely and are now in the process of figuring out how their own brands need to come to terms with this new reality. 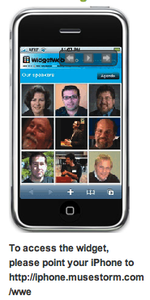 Whether we know who Robert Scoble, Hugh McLeod or Guy Kawasaki is—is irrelevant. 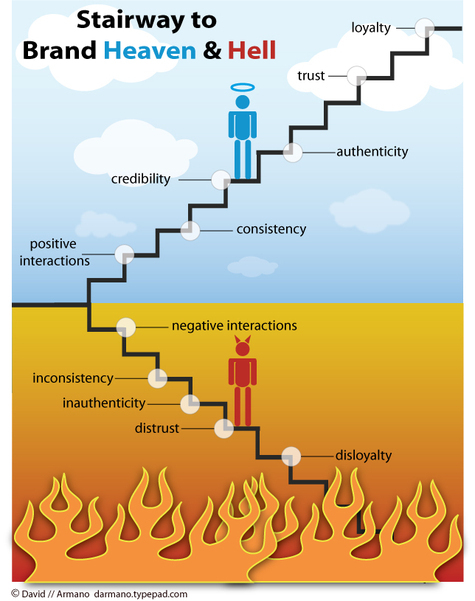 Brands + Amplification = Influence on the other hand, is not. If you are reading this post—you can thank the power influence of social networks. And thank you for some food for thought—which is always a good thing. Colonel Tribune -- and the Chicago Tribune – is organizing an informal meetup Thursday, June 12 from 6 p.m. to whenever at Clark Street Ale House, 742 N. Clark. 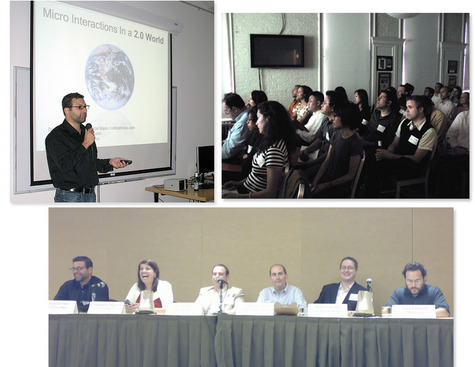 And I will be talking about "Micro-Interactions" at NYC's IXDA event in Soho. There will be a social gathering after and all are invited. See details here. Really excited about this one. I'll be participating in an interactive discussion with execs from Virgin and Facebook around experience design etc. PSFK San Fransciso has a really amazing line-up including Chris Riley from Apple, Gareth Kay from Modernista! and Rohit Bhargava author of Personality Not Included. Check it out. Special Thanks to Chris Fahey for inviting me to Web 2.0 in NYC. I'll be presenting Micro-Interactions in no doubt a more refined version. If you are attennding any of these events, let me know. Best way to get a hold of me these days when on the road is Twitter. Inspired by a chat with Jared Spool.